Notes: To slice cucumbers quickly, use a food processor. In a bowl, mix lamb with garlic, oregano, 1/2 teaspoon salt, and pepper. Shape mixture into 8 equal oblong patties, each about 1/4 inch thick. Place patties on a rack in a broiler pan. Broil 4 to 6 inches from heat until meat is browned on each side and just barely pink in center (cut to test), 7 to 10 minutes total. While lamb patties cook, peel cucumbers and thinly slice. Mix slices with yogurt, mint, and lemon juice to make a cucumber salad. 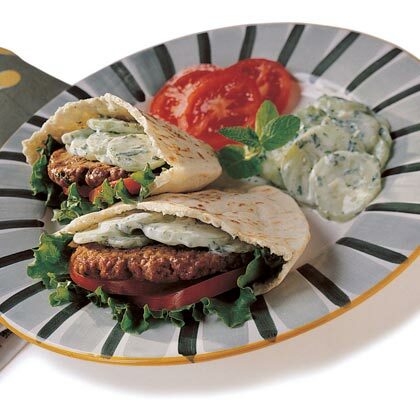 On each of 4 plates, place 2 lamb patties, 1/4 of the cucumber salad, and 2 pocket bread halves. Tuck meat into bread, adding cucumber salad and salt to taste.